Not a lot of progress this weekend, but I offer an amusing aside. 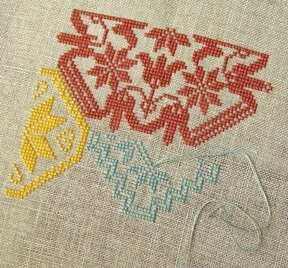 We are supposed to be recreating this heirloom sampler exactly as it was stitched 220 years ago, flaws and all, yet I find myself fighting an uncontrollable desire to correct the pattern, and losing. Forgive me, Mary Wigham, but I want your medallions to be as perfect as possible and I can’t control my inner neat freak. Besides, it’s fun seeing if I can get all the various arrangements to fit correctly in the end. I can imagine that adjustments were made by the original stitchers as they went along, so in a sense I feel I am doing the same thing, thus making this sampler a little bit my own as well. « "It’s the challenge that’s the fun"
Lovely progress! I am always afraid to change errors because I would get to the 3/4 finished mark and realize that I couldn't get it all to fit. Math has never been my strong suit! YGG–I can't wait to see it as you progress! I think it makes it your own, too.